Make your old computer run like new. Keep your new computer running fast and problem-free. System Mechanic Pro repairs drive and registry errors, stabilizes your computer, optimizes your internet connection, scrubs sensitive data, and defends against malware and intruders. Without regular "tune ups," all computers slow down with use. Junk files accumulate on your system. Fragmented drives, a cluttered registry, and driver conflicts degrade PC performance, leading to system crashes and freezes. System Mechanic Pro combines 6 powerful products to secure your PC and maintain it in peak condition, offering total PC care and security in a single integrated package. The software runs automatically, intelligently cleaning and tuning your entire computer. 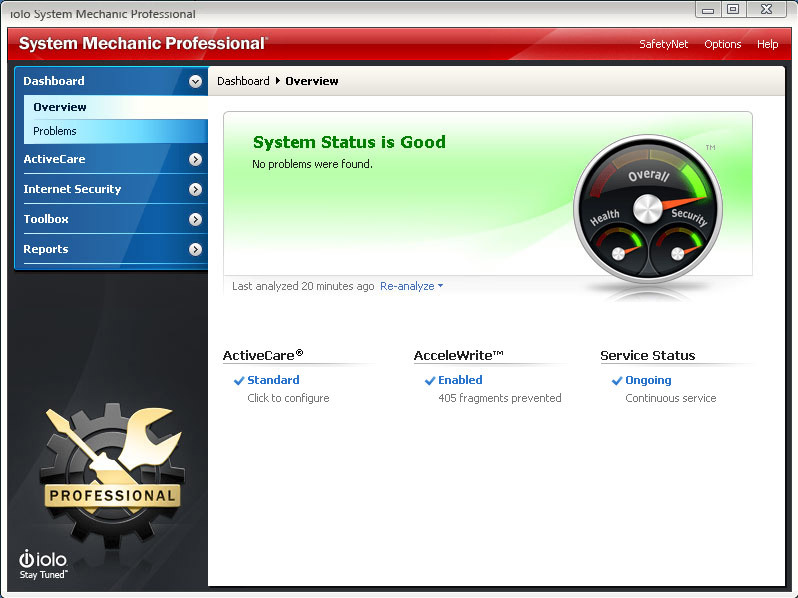 Or you can launch select tools in System Mechanic Pro whenever you think your system may need a boost. Performance and security tools include registry repair; hard drive, memory, and registry defragging; junk file and file fragment clean-up; application management to reduce overhead; antivirus and firewall protection; true data recovery to restore lost or deleted files; and military-standard file erasure and drive scrubbing. A licensed version of System Mechanic Pro may be legally installed on up to 3 computers. Nr2W2w Keep up the superb work , I read few posts on this web site and I conceive that your web blog is rattling interesting and contains bands of great information. Hi and thanks for your inoaimftrve posts! Being a passionate blogger myself, I’m happy to view other people making moves for their local community. I just wanted to display my gratitude for your personal publish as it’s rather inviting, and many authors do not get the credit they should have. I am confident I’ll be back again and will send a number of my pals. 9OTjCw I think other website proprietors should take this site as an model, very clean and excellent user friendly style and design, as well as the content. You are an expert in this topic! 4k7wgk You have made some good points there. I checked on the internet for more information about the issue and found most people will go along with your views on this web site. 3XajpU Helpful information. Lucky me I found your web site accidentally, and I am shocked why this accident didn''t happened earlier! I bookmarked it. eXGpot You completed a few nice points there. I did a search on the topic and found a good number of folks will consent with your blog.